Tonight my team are playing in the second round of the summer knockout cup. To allow teams from all the league divisions to compete on an equal footing, the cup, played over 4 boards, has a handicapping system. It used to be simple: if the difference between the teams was 1 division, the lower team got a 0.5 head-start added to their score; 2 divisions a 1.5 head-start; 3 divisions a 2.5 head-start; and 4 divisions difference gave the lower team a 3.5 head-start. Noting that some lower teams were disproportionately strong led to a revision of rules based on the total grading of the team, and more recently to a complex set of changes based not only on total grading of the team, but also on the grading of the board 2 player. The upshot of this is, unless you've remembered to take rules with you to a match, you can be sat there not knowing how many points you need to progress. This is what happened in our first round encounter with Forest Hall: we'd won on the other boards and just my game remained. Unfortunately, I didn't know whether a win or a draw was needed to make sure we progressed to the next round. and now White should try 6 Kxe4! 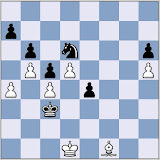 when it is Black who has to find the right moves with the Knight to stop the d-pawn and prove a draw. Instead White played 6 Bxc4? and after 6 ... Kxc4; 7 Kxe4 Kxb5 Black went on to win. As it happens, a draw would of been sufficient. Not that that would have been in my nature anyway! I'll think about taking the rules to tonight's match.